The Aspire Nautilus glassomizer is a revolutionary design based on feedback of seasonved vapers of what an ideal tank should be. Utilizing this information, the engineers have created a new tank that provides optimal performance in vaping functionality.The Nautilus has an exclusive adjustable airflow design so that with a simple turn of the lower ring, you can increase or decrease the airflow to realize your perfect vape. With the option of different sized air-ports, it allows the user to produce big clouds of vapor, with a pure and clean taste. The unique Nautilus four-port system allows you to differentiate how hard or soft the draw, how warm or cool the vape is, and how much vapor is produced. 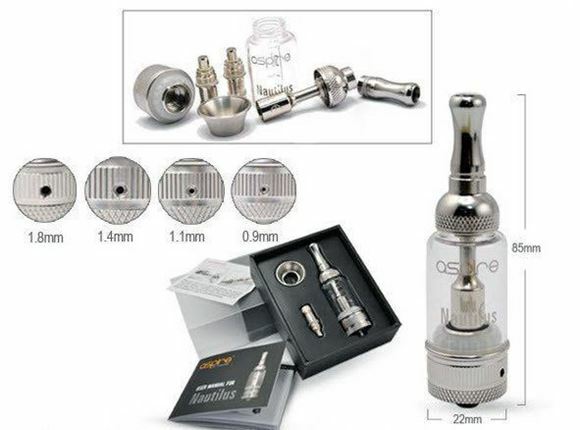 To fill, turn the Aspire Nautilus Tank upside down and remove the threaded end cap. Fill the outer portion of the tank (avoid getting e-liquid into the center airflow tube) and then screw the end cap back onto the tank tightly. You can now turn it rightside up and check for leaks before using.